The experimental part of this project has been performed using previously build platform consisting of a frame covered by a sheet of glass. The fluid is then released to flow under gravity down a plane. Very quickly the fluid front (contact line) becomes unstable and develops patterns. The figure below shows the resulting pattern for the flow of partially wetting fluid (glycerol) down an `inverted' plane characterized by an inclination angle of 120 degrees relative to horizontal. The students used small amount of food coloring and in addition image processing to reach high contrast allowing for good visualization. 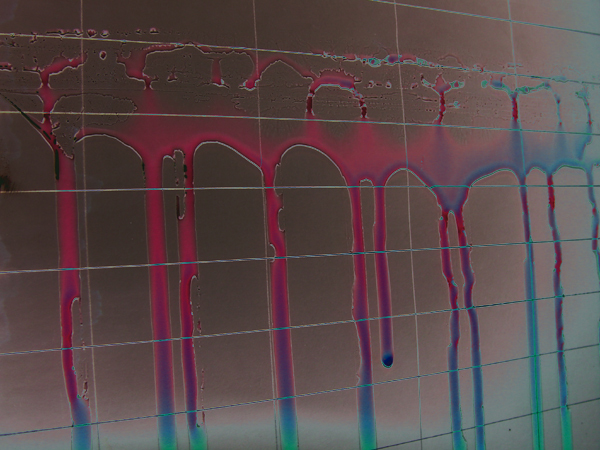 In order to be able to compare experimental and computational results, the students recorded the fluid dynamics using a digital camera. These results were then processed using image processing software so to extract various results, such as the growth rate of unstable patterns. These growth rates were later compared to the theoretical and numerical results. The theoretical part has involved a number of different directions. Students, or student groups, were assigned complementary projects with the idea of having them concentrate on one given aspect or technique, but also be exposed to the complete problem via interaction with their colleagues, weekly informal seminars, etc. The student projects have included linear stability analysis, numerical simulations of highly nonlinear PDE's using explicit and implicit methods, and analysis of the self-similar solutions. 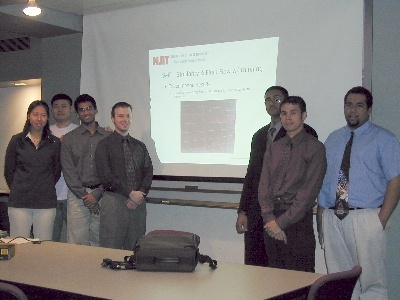 The photo below was taken at the final students' presentation that took place as a Special Applied Math Seminar on May 08, 2003.